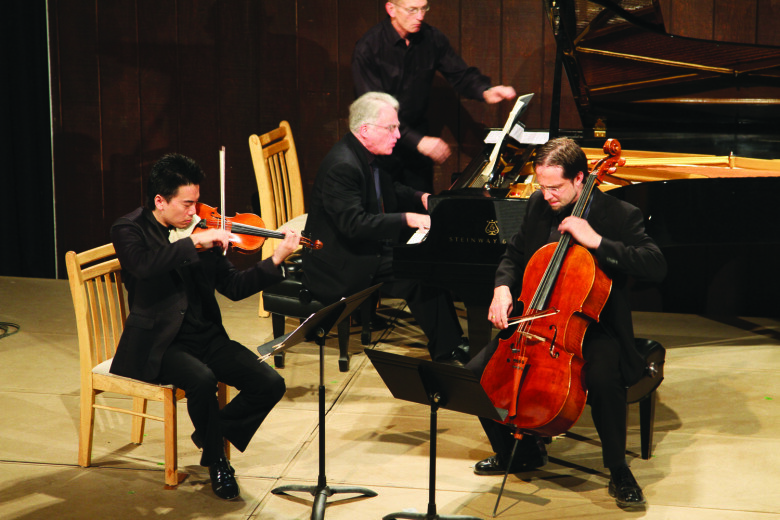 The 2013 Season of the Methow Valley Chamber Music Festival, July 25th-August 3rd, continues to refine the qualities that have made the Festival so popular. A festival created for both the neophyte as well as the seasoned chamber music lover, the festival programs artists and repertoire that is sure to excite in a venue cut from a dream of a soul-satisfying summer arts experience. Though the festival often contracts younger players, the festival’s first weekend will showcase lauded veterans of the chamber music festival scene. Virtuoso Violinist Paul Rosenthal, a student of the great Jascha Heifetz, will be performing some of his favorite pieces with some of his favorite musicians. Roland Kato, Principal Viola of the well-known LA Chamber Orchestra, Armen Ksajikian, Assistant Principal of the same orchestra and Agnes Gottschewski, a long time chamber music partner with Rosenthal will be presenting some of the most ravishing chamber music ever penned including the work of Sergei Taneyev, teacher of Tchaikovsky and possibly the greatest Russian composer you’ve never heard of. Many music historians believe Taneyev simply was lost to the ill-fates of his placement in history even though his music is a blend of the rich intelligence of Brahms and the great passionate depths of Tchaikovsky. With crowd-favorite, Craig Sheppard joining the string players for piano quintets by Mozart and Taneyev, the sparks are sure to fly. Paul will be bringing his great Guarneri “del Gesu”, the most famous violin maker after Stradivari and maker of instruments preferred by many violinists. The second half of the festival welcomes many familiar faces that bring so much energy to the festival. Highlights include the return of Yuri Namkung, the sweet and soulful dynamo leading all eight string virtuosos in the monumental Octet by George Enescu. Also, after a rousing standing ovation for his 6 minute work of last summer (search YouTube for Toy Bricks), the cross-over power-cellist Paul Wiancko will be presenting a full three movement work to be premiered at the festival this summer for string quintet. For a change of color, the fantastic newly-appointed principal horn of the Seattle Symphony, Jeff Fair will lead the amazing Brahms Horn Trio, a piece many list as their favorite piece of chamber music, in a performance that is sure to bring the crowd to its feet. This year the festival will also be bringing in a Fellowship String Quartet of college students from Seattle University. The students will rehearse in the same building with regular coachings and lessons with the artist faculty as well as the opportunity to be a fly on the wall in this rarified environment. When they are not practicing and rehearsing, the quartet will be performing throughout the valley as well as coaching students in the local Pipestone string camp. The Methow Valley Chamber Music Festival’s innovative programming and wide appeal has made it a summer must for many in the Northwest. Artistic Director, Kevin Krentz has a background in rock and roll, Broadway, and Barbershop and knows that a great concert must speak to the heart, head, eyes, and stomach. The spectacular venue, local beers and wine and food, charismatic performers and music that is at times virtuosic, funny, intense and gorgeous is sure to please just about anyone.